The marketing campaign revolves around the fact that it divides opinion. People either love it, or hate it - and I'm talking about the product, not the marketing campaign. Personally I don't like the flavour of Marmite, but that doesn't make it a bad product - it's just down to personal taste (no pun intended). 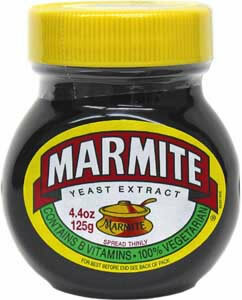 Marmite is probably the most famous product for splitting opinion, and the manufacturer plays on that point. The same can be said about books. Let's take one as an example - The Da Vinci Code. At the time of writing this post it had 4,276 reviews on Amazon.com. 18% of those were one star. Yet it is a book which has sold in its millions. Even with so many negative reviews, Dan Brown's next book, The Lost Symbol, was a big success in terms of sales, and looking at the reviews on Amazon, had as many bad as good reviews. Many of the negative reviews were perhaps as a result of all the pre-launch hype (there was a six year gap between the two books, and The Da Vinci Code had created a certain expectation for what was to follow), but that said, there were equally as many good reviews. Later this year Dan Brown's latest novel, Inferno, will be released. It too, I predict, will receive mixed reviews, because like everything in life, it will divide opinion and taste. But I also predict it will sell in large volumes, as Brown has now created a solid fan base, and most of that will have been achieved via reviews and recommendations in the past. As authors we need to accept we will get negative reviews (see my post about how to handle bad reviews) and realise not everyone will enjoy our work. The alternative is that nobody reviews our books, and the good reviews are not written, which in turn means there's no one to help light the all important sales fuse. To end this post on a light note, here is possibly the best (and shortest) book review of all time from Ambrose Bierce (b 1842 d 1913) - "The covers of this book are too far apart."